As you may know, I teach elementary art. My favorite lessons are in the Spring when we get to draw and paint flowers and still lifes. 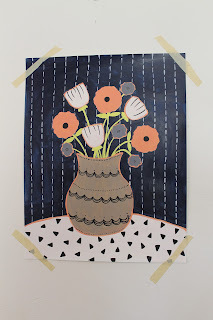 Like a lot of lessons, I like these because they start with simple shapes- so it doesn't have to feel too overwhelming for those with low art-confidence. Drawing flowers is something people have some visual knowledge of. Even if you are not a scientist, you know the general make up of a flower, so there is some common ground to start from. And lastly, because it's a painting and an art lesson, there is freedom to make things look artistic without being perfect. As we say in class, don't worry about making mistakes. Everyone and every artist makes mistakes. You can either leave it and move on, fix it now or later, or start over if it's just too big. 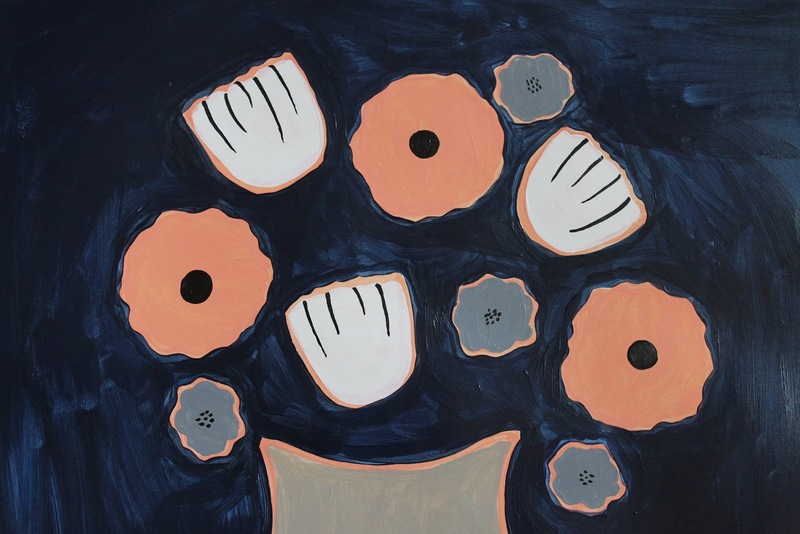 I hope you enjoy my new addition to The Almond Flower, Art Lessons and DIY projects. 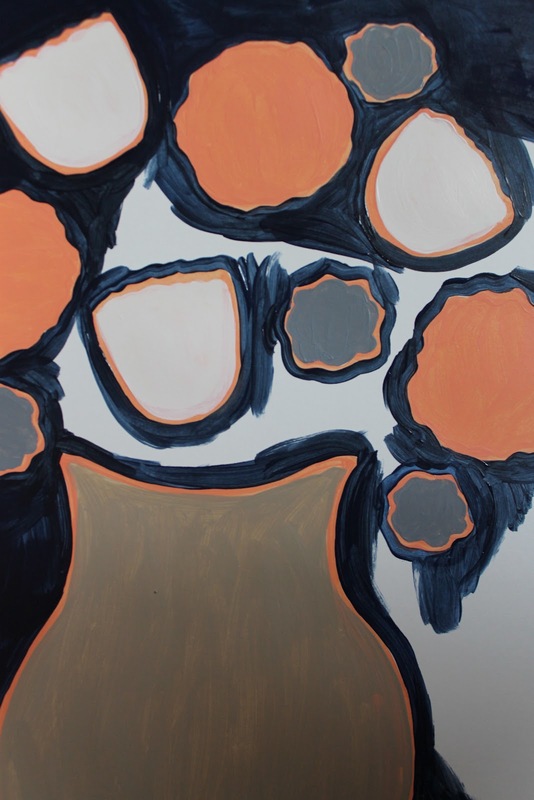 Acrylic Paints- for this painting I used white, cadmium red light, black, cadmium yellow, cobalt blue and raw umber. 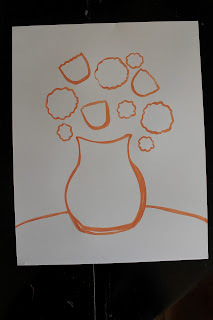 Step 1: Outline the vase, table and flower shapes with paint. If you want, draw in light pencil first. 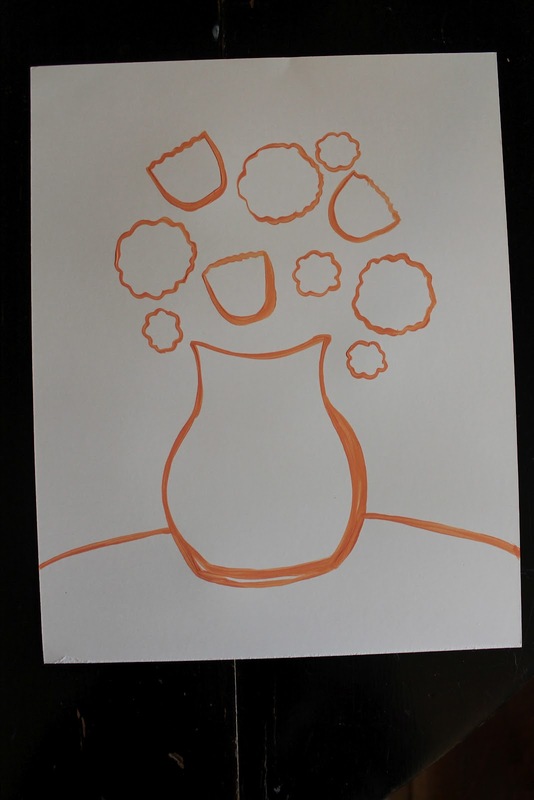 Start with the vase about halfway down the page- you want to leave enough room for the flowers. You can see the mistake I made with the vase shape. I kept working to make it symmetrical and the mistake lines were covered when I filled in the vase. See, no worries! 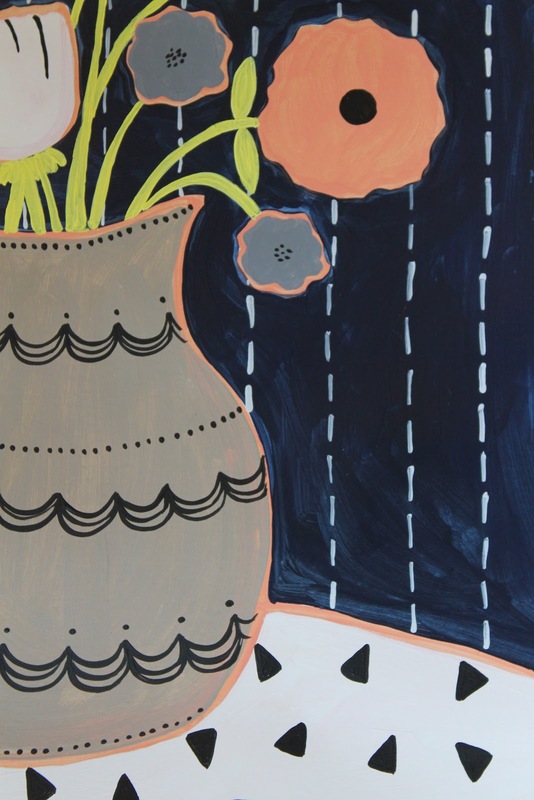 When you paint the flowers, keep the shapes big and simple because you'll add details later. 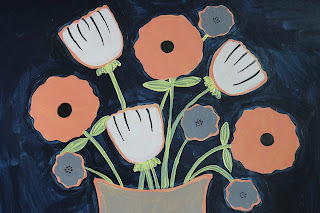 Think of painting three large, medium and small flowers, mixing them up so the result is balanced. 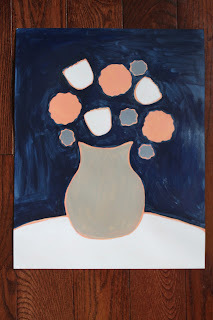 Step 2: Paint in the flower shapes, vase and table. I like the bold outline of this still life. If the extra outline bothers you, then skip painting step 1, just draw in pencil and begin painting things in. When filling in, remember to outline the inside of the shapes so the edge is very smooth. Also remember to keep your paint wet enough that it paints smoothly. If it doesn't have enough water added, it feels very thick and sticky and you end up using a lot more paint than is necessary. It's also important to hold the brush correctly- like a pencil, straight up and down not on its side, and your paint strokes should move back and forth evenly. Step 3: Paint the background. Outline the outsides of your shapes first and then fill in. This allows you to have a nice edge where the flower shapes meet the background. Some painting teachers suggest painting the whole background first and layering the flower and vase shapes on top. You can certainly try this, but I think it's more rewarding to see the image first before you do all the work of painting the large background space. I also work with 5-10 year olds, so you may have more patience! Step 4: Add flower details and stems and leaves. I like to keep flower details simple. 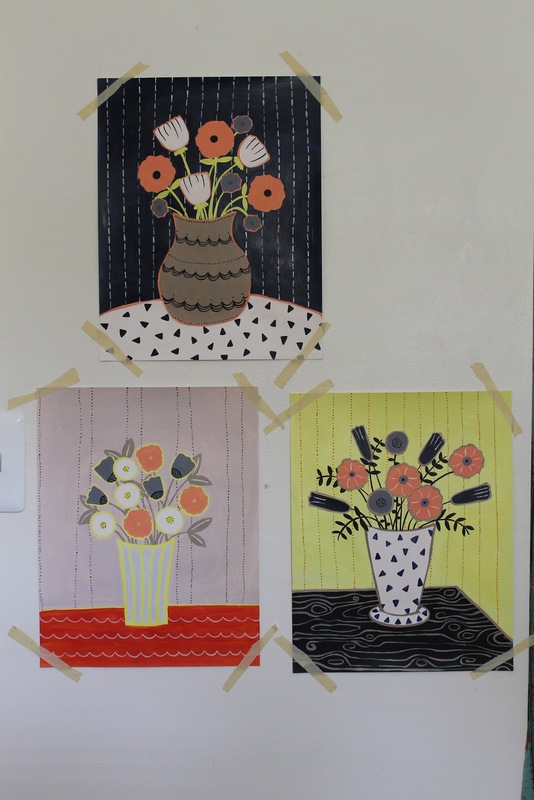 Just think of using different sized dots and circles and different lengths and widths of lines. For the stems and leaves, remember to show overlapping. So when you paint the line of the stem and you find another flower in your way, stop and start on the other side of the flower where you guess the stem would continue. This is a good chance to fill in negative space. Think about the placement and size of the leaves to make the still life look believable. Step 5: Add vase, table and background patterns. I love patterns! 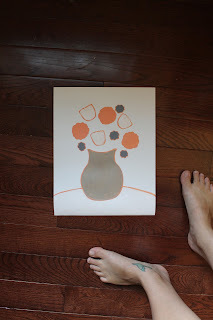 Use a small brush and remember to continuously dip your brush to paint those little lines and dots. If you don't have enough paint on the brush, then you will press harder. This results in a wider, dry and messy line. It may take a little longer, but having consistently smooth lines will look much better in the end. Voila! 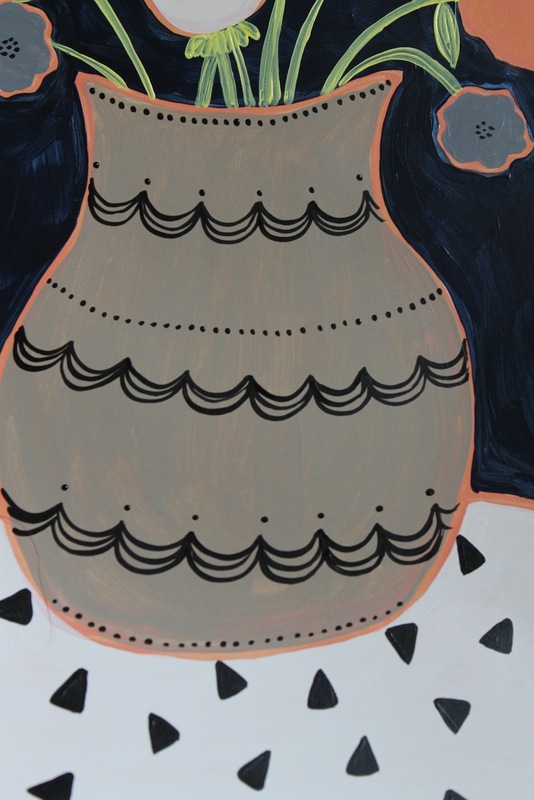 A hand painted, original design still life. Light enough to tape or tack on the wall, but nice enough to frame. Happy painting! 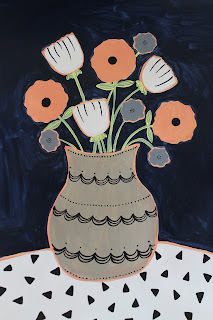 If you would like to purchase one of my paintings, visit my etsy shop PeacockMercantiles or contact me to request a custom work.